If you’ve ever been to a big vacation destination, you might be familiar with the prevalence of timeshare pitches. Salespeople will want to entice you with free tickets to a show or monetary incentive just for attending these presentations. And of course, it’s an offer that’s hard to resist. While timeshare attorneys would advise you to not even attend these presentations in the first place, it’s possible that your curiosity might win out. But unless you want to work with a timeshare cancellation lawyer in your future, you should heed the following advice to resist the tactics you’ll no doubt be subjected to during the course of a timeshare pitch. Believe it or not, attending a timeshare pitch on an empty stomach or with some liquid courage could really work to your detriment. When you’re hungry, your body chemistry actually changes to focus on your most immediate needs. That means that your cognitive thinking and decision-making abilities are actually lowered. Some timeshare sales teams will try to entice you with a fantastic meal after the presentation for this very reason. When your tummy is growling, you won’t be able to focus on much else — making you more likely to agree to buying a timeshare you don’t want and can’t afford. So be sure to eat something substantial if you do decide to attend one of these presentations. While you’re at it, stay away from the alcohol before you go. Drinking will lower your inhibitions and make you much more likely to make a mistake. Instead, bring along a bottle of water with you and wait to indulge in a cocktail until afterwards. Remember that there’s strength in numbers. The timeshare industry is valued at $70 billion, meaning that most of these salespeople know exactly what they’re doing. But you’re more likely to resist their tactics if you bring along someone to support you. This could be your spouse, friend, or close family member. In some cases, timeshare sales representatives will attempt to separate pairs into different groups under the guise of “breaking the ice.” This, of course, is merely a method to weaken your resolve and make it more likely for one person to agree to purchase a timeshare. Unless you relish the thought of going through the complex timeshare cancellation process, don’t fall for it. Make sure to stay with the person you bring at all times — and that you are unified in your quest to turn down the timeshare offer. If you’re afraid of your inability to resist a high-pressure sales situation but are still determined to hear the presentation (against your better judgment), here’s another way to beat the system: leave your wallet, credit cards, and checkbook in a safe place in your room (say, in a provided safe) or with a trusted family member. That way, even if you feel yourself beginning to falter, you’ll have no choice but to return to your room to retrieve your payment method — and mull over this scenario logically in the process. Anyone is vulnerable to being caught up in the excitement of a luxury vacation opportunity; this will force you to think clearly about the decision at-hand and make an informed, level-headed choice about what your next move will be. And unless you want to face future timeshare cancellation, the clear choice is to resist the pitch and take whatever extra incentive they’ve offered you for sitting through it. 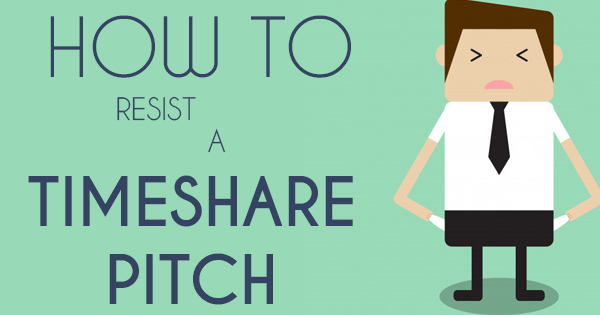 While these tips can prove to be an effective way to resist a convincing timeshare pitch, the best course of action is to avoid this situation entirely. Otherwise, you could be prone to making a huge mistake that will result in the need for timeshare cancellation. If you or someone you know is looking to get rid of a timeshare purchase but aren’t sure how, please contact us today.